Description: 17G heads west through King at 1830 with 4 engines and 4 cars. Description: A late running NS 212 heads east through CP Burn with six units. Description: A closer view of 212. The second unit is a former Conrail SD50. Description: Higginsville Road, Readington Township, 1359 hours. Description: 9547 rests between assignments at Colehour Yard on the IN/IL border. Description: Not the best shot, but I still got most of the locomotive. 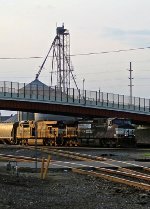 Description: NS 9547 leads a westbound freight past the Bryan freighthouse, and NS 7132, at Bryan, OH.